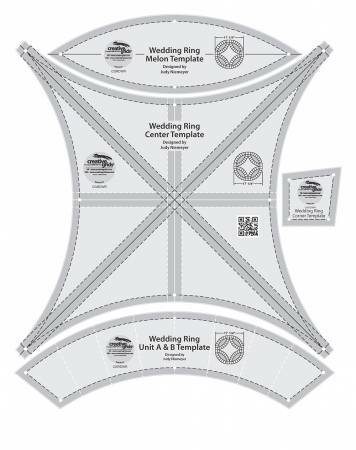 This Double Wedding Ring four piece template set, designed by Judy Niemeyer, was designed to work with her double wedding ring patterns. Or use these 17-1/4 inch templates to cut the segments needed to create a double wedding ring quilt. Mark the fabric through the holes in the template to mark the center of the curved sides to make piecing a breeze. All of the curves can be cut with a 45 or 60mm rotary cutter. The templates slide easily over the fabric until pressure is applied. Then, our exclusive gripper holds the fabric in place while cutting, eliminating slipping and miss-cuts! The template set comes with fully illustrated step by step instructions or scan the QR Code printed on the ruler to view a video demonstration.